a suite of tools for small molecule drug discovery. The Schrodinger Suite runs on Linux and Mac workstations, but due to its size, it is not included in our default installation. Only available to members in North America and Australia. This suite is not included in the default installation due to its size. Please email licensing@sbgrid.org to add the software to your collection. SBGrid makes the full Schrödinger Small-Molecule Drug Discovery Suite available to non-profit groups located in North America and Australia. This suite contains applications for cheminformatics, molecular dynamics, docking, QSAR modeling, and homology modeling, and includes a host of other tools. Members can easily access Schrödinger software through an SBGrid-hosted license server. 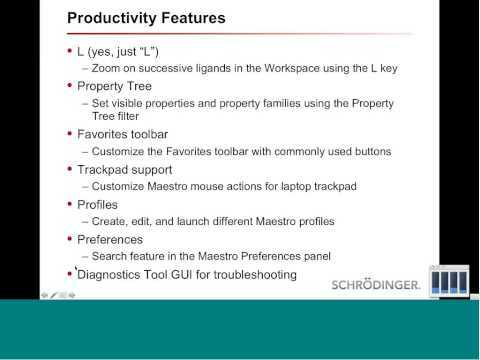 The current SBGrid license, due to expire in June 2019, provides unlimited access to Maestro, Schrödinger’s molecular visualization software and the general user interface. For other applications, Schrödinger operates on a token basis, with different jobs requiring a different number of tokens. Our license allows for 125 interchangeable tokens for the use of AutoQSAR, Canvas, ConfGen, Core Hopping, Desmond, Desmond GPU, Epik, Field-based QSAR, Glide, Jaguar, Jaguar pKa, LigPrep, MacroModel, Phase, Shape Screening, Prime, PrimeX, QikProp, QSite, SiteMap, Strike, XP Visualizer, KNIME, OPLS3 Force Field, and FFBuilder. For applications that require dedicated licenses, SBGrid members have access to floating licenses for BioLuminate (10) and PIPER (5). We also have 15 seated licenses for the Protein-Ligand Database. For large scale Glide computations we also have 40 Glide/XP Visualizer dedicated licenses, which members can reserve in advance by emailing bugs@sbgrid.org. Schrodinger provides many different software programs. Please cite these individual programs using the citations in AppCiter. "Recent Enhancements and Scientific Advancements in the Schrödinger Suite"
Presenter: Woody Sherman, Schrödinger Vice President of Applications Science.